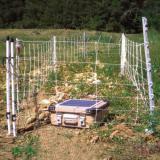 Specifically designed (if properly energized) to keep feral hogs out of fields, gardens, lawns and yards. 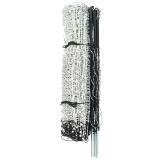 The large amount of strands in a 24" fence increases visibility in brushy locations. Good for areas with high hog pressure. Can also contain domestic pigs. 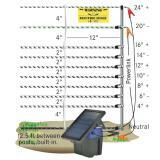 Can be set up as Pos/Neg (for dry, rocky, sandy or winter soil conditions) or Pos/Pos for (moist conditions). To stop feral hogs and contain domestic pigs. 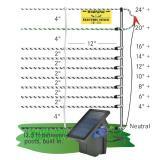 Pos/Neg Fences are for dry, sandy or rocky conditions. Ideal for situations when there is too little moisture in the soil to properly ground the fence. Horizontal Spacings 4" 2", 2", 2", 2", 2", 2", 4", 4"
Feral hogs are a rapidly growing problem. 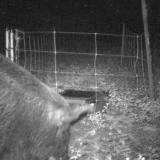 It's common for hogs to find ways through, under or over physical barrier fences. Electrified fences are more reliable because hogs use their noses to investigate new situations. When the bare nose contacts an energized strand a powerful, but very brief pulse of electricity passes through the hog- causing sudden, sharp pain. For dry areas install as a Pos/Neg fence. Connect the energizer fence lead to the positive "+" net clip and energizer ground lead to the ground rod. Then connect a PowerLink from the negative "-" net clip to the ground rod. For moist conditions connect both net clips together and attach energizer fence lead to net clips then attach energizer ground lead to ground rod. 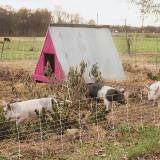 These portable fences are awesome, it's a easy and fast way to partition off my pigs or expand on grazing area. I have 12 of these so far and all are great quality. I purchased this product for typical backyard garden without traditional grass. I have my garden within an enclosed space that has wood mulch or river rocks under the fence. This prevents weeds from being in the garden and also prevents weeds from growing into the fence. However, neither rock or dry wood mulch are very good conductors, so animals standing on these during dryer times will not get much of a shock. I can prove this to myself by easily holding onto this fence when standing on the dry mulch or rocks (the single fence is connected to the Solar IntelliShock 60 Energizer Kit, which is supposed to be able to power three to five rolls of netting). Yes, there is a shock, but no, it would not discourage me from entering the garden. That's where this specific fence design comes into play. By alternating hot and negative wires, animals typically have to hit two wires to get through (and definitely to get over) the fence. Because they are then hitting both the positive and ground, rather than the positive with a weak connection to the ground, they actually get a discouraging jolt. This fence has worked well and my many tomatoes, bell peppers, lettuces, carrots, and watermelon have not been bothered. My yard regularly has squirrels, rabbits and raccoons near the fence, but I have never seen them inside. The only thing that would make this fence more perfect is the spacing between the non-charged and non-negative bottom wire (it is nothing more than string). The current spacing is four inches before moving to 2 inch spacing above that. Squirrels and smaller animals can easily get under the bottom wire without touching it. To solve this, I simply buried my fence about 2 inches into the mulch and rocks. However, a fence designed similar to this without the 4 inch spacing before the first hot row would alleviate this problem. As long as you consider everything I've said, you should be able to keep any garden you have secure, no matter the ground surface it is on. One other note- the spacing between guide posts is 12 feet. This is way too far and the fence will sag, no matter how tightly you pull it - you'll have to buy extra posts. I went with 30" posts for this 24" fence as they could be put in deeper for more support. They have held for several months now with no problems. The 24" posts that come with this fence can not be put in deep enough, so they sag and even "pop out" when the ground is too wet. This fencing is working spectacularly well for us! We are pasturing our hogs and move them daily. Since they were already trained to white electric fence they knew what it was and showed great respect. One pack of extra step in posts per 100 feet is more than adequate for saggy spots. If you pull the attached spike/post against the vertical wire as you install the fence, it diminishes sagging. I am 61 year old woman and can move 200 feet of this fencing and have it ready for hogs in 15 minutes. I am buying additional today and recommend it to other folks wanting to pasture their hogs...it sure cuts down on the feed bill. 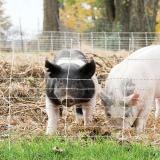 I own several of these hog fences and love them! They are light weight, making them easy to carry and set up. They are also low to the ground, making them easy to step over. I use step in posts to keep them more upright and sturdy. The key feature is the black - cold - bottom wire. Grass does not have to be cut shorter than the first hot wire, making set up easier and avoiding the nuisance of a popping fence. I recommend them highly! Yes, it does sag between posts, but we have easily remedied this with cheap fiberglass step ins. Paired with a strong charger, this reliably keeps our pigs where we want them, plus it is easy to move. Am about to buy another one.